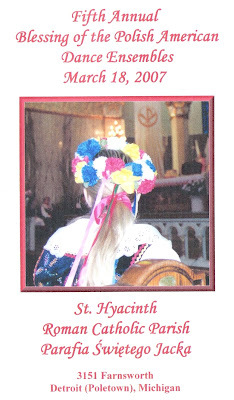 On Sunday, March 18, 2007, members of the Wawel Folk Ensemble participated in the annual blessing of the Polish American Dance Ensembles at St. Hyacinth's Church in Poletown, Detroit. 2007 marks the fifth anniversary of this event, established by St. Hyacinth's pastor emeritus, Fr. Francis Skalski. Wawel has participated in the event since its beginnings. The event has grown since the first annual blessing. This year's mass featured 21 different Polish folk ensembles from the Metro-Detroit area. Groups come from as far as Flint, Michigan to attend this annual event.